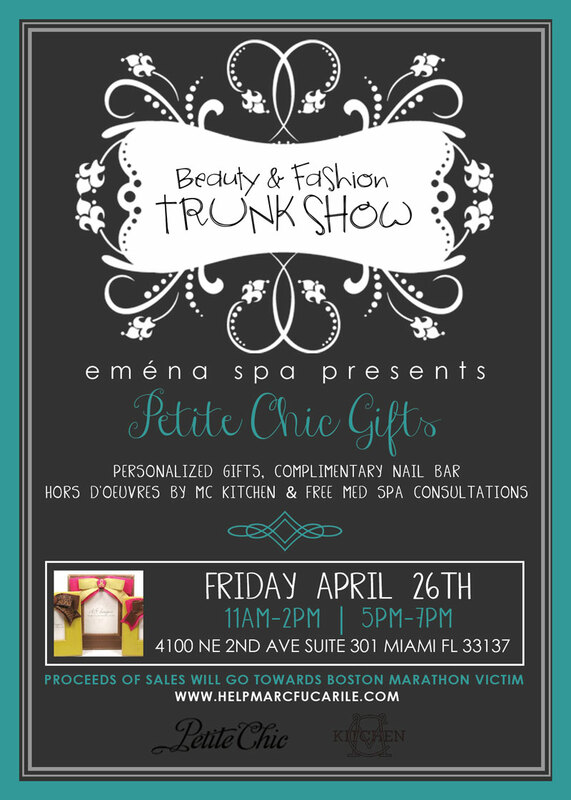 With Mother’s Day being just around the corner, Emena Spa Presents a Beauty & Fashion Trunk Show Starring Petite Chic Gifts. Petite Chic specializes in personalized and custom made-to-order gifts for all occasions, in addition to a variety of readily available products for all of your gifting needs!Join the Emena Spa Staff for a Pre-Mother’s Day celebration as we personalize gifts while enjoying delicious Hors D’oeuvres by our lovely neighbors, MC Kitchen. In need of a polish change? Don’t worry, just stop by our nail bar and pick a Spring color of your choice.If you want to learn more about our med spa services come in for a free consultation!